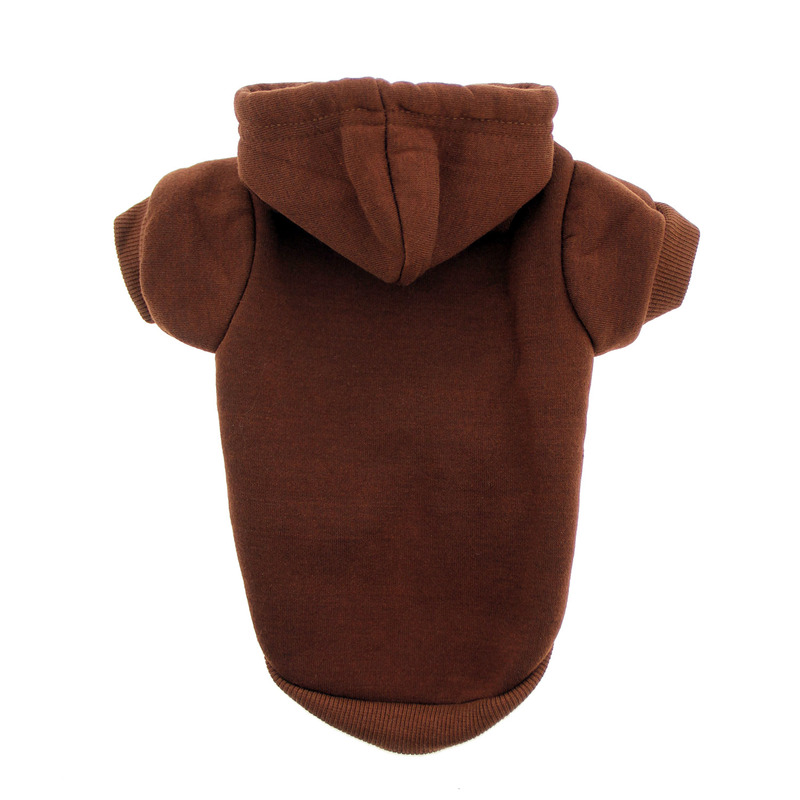 Keep your pets clean and warm when they are outside, or set your dog apart from the others with their own style with this Plain Dog Hoodie in Brown by Mirage. Stand out among all the other dogs! 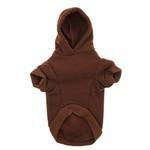 The Plain Dog Hoodie in Brown is a cool, comfy design for a perfect look year-round. Plus, the bold look makes quite a fashion statement! 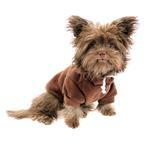 This brown pet hoodie is perfect for puppies and dogs that like to get down and dirty. This is the perfect color that resists looking grimy! The cozy, soft fabric helps keep pets warm both indoors and out. Even hairless cats will enjoy this soft hooded sweatshirt for pets! The ribbed trim and high-cut tummy of this hoodie give a comfortable fit that can be worn all day. The leash access hole makes walking a breeze! This dog sweatshirt is great for keeping pets warm on hikes and on camping trips. Thanks to the plain style of this dog hoodie without a pocket, this sweatshirt is great for personalizing or screen printing on your own. Commemorate a special event! Plain can be good too, though. It's a classic and simple style for your pet! Garment care: Made of 65% Cotton 35% Polyester. Machine wash in warm water on a gentle cycle. Lay flat to dry. This dog hoodie by Mirage fits smaller than some of our other brands so be sure to check those measurements! Very nice Hoodie but it does run small. We needed a bigger size. Posted On 06/20/17 by Jennifer S from Morristown, TN Yes, Jennifer S recommends this product! Runs very small but cute. Had to return item but plan to get one in a larger size. Posted On 12/23/16 by sarah f from , MA Yes, sarah f recommends this product! XL is very small. The "Basic" line seems to run more true to size than the "Plain" line of hoodies. Posted On 12/15/15 by MARI W from Dallas, TX Yes, MARI W recommends this product! Posted On 11/26/15 by Thomas M from ansonia, CT Yes, Thomas M recommends this product! Posted On 11/16/15 by C L b from Cookstown , Yes, C L b recommends this product! Besides Coat, only thing my dog will wear!! Posted On 01/21/15 by Christie P from , NJ Yes, Christie P recommends this product! My dog loves his hoodie and it is so comfortable and he doesn't look out of place with it on. Posted On 01/18/15 by Christie P from , NJ Yes, Christie P recommends this product! This is a great product and true to size. My pup hates wearing clothes but loves his hoodie!